Inbound marketing is the bee's knees! Unlike many other marketing strategies, inbound focuses on everything from getting noticed through delighting current customers. As you could guess, there are many moving parts to any successful inbound marketing strategy...some easy, minimal tasks, some time consuming, difficult tasks. 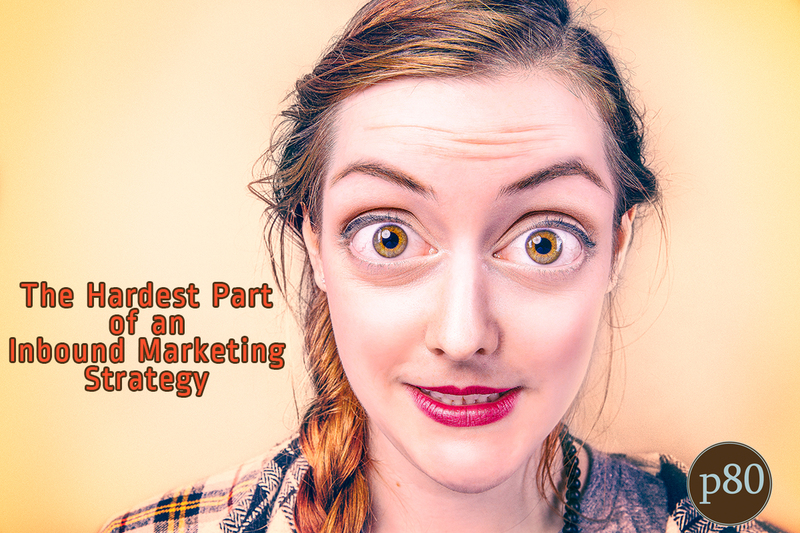 So what's the hardest part of an inbound marketing strategy? While this is my opinion, I will say that it's an easy answer: content. Website page content - The content on your actual website pages should work in tandem with all other types of content. If you are starting a new inbound strategy from the ground up, it's likely this stuff will need rewritten. Blog post content - These are the "article" based content pieces. Without these it will be incredibly difficult to be successful. Premium content (Offers) - You'll need content to help drive lead generation. These are usually content based often in the form of ebooks, whitepapers, guides, videos, webinars, etc. CTAs (Call-to-action) - These won't require you to write a lot, but technically they are content and need created. These will drive people from your website pages and blog posts to your landing pages containing the premium content. Landing page content - Yes, these need content as well. It's not a lot of content but the language needs to be convincing enough for a visitor to want to take you up on the offer. Thank you pages - Minimal, but still important. They need content. Email responses - When someone converts they will likely expect an email response. This needs content. Email automation (lead nurturing) - For every offer there should be a lead nurturing process involved. Some of these will be more in-depth than others, but in many cases they will be a series of emails. Some of these lead nurturing workflows may even lead into someone into an alternative lead nurturing workflow based on some sort of action or lead scoring. All of that is content. Perceived Value - The people that are consuming all of the content must feel like they are getting some sort of value from it. This comes into play not only when you are trying to get them to convert, but also when they are part of your lead nurturing efforts. Even if they enjoyed the initial offer immensely, they'll unsubscribe from your email marketing efforts when you stop providing value. Volume - We are talking content for each of your buyer personas and for every stage of the buyer's journey. Take the above list and start multiplying. Planning - Even your content planning has content. Don't worry, this is only for internal use so it's a bit more forgiving. However, you can't approach this beast without documenting your plan of attack. Consistency - Many things can be done early in the stages of your strategy, but that doesn't mean you can forget about it for the next several months. You will need ongoing content and revisions of your content based on the data collected. I don't mean to scare you...but I'm also not going to sugar coat it. Inbound marketing IS all that it's hyped up to be, but it requires effort. There are things involved other than content, but it's a driving force of any successful inbound effort. Failing at content will cause you to fail overall.